Following our story last month about the availability of the RMK 4500 under construction in Turkey, RMK Marine tells us they have had a great deal of interest in the boat and several visitors to the yard as a result, and they have sent us some more pictures. She was designed by Ron Holland to a very specific brief for long distance cruising with low maintenance requirements. She has an elegant, comfortable interior by Design Unlimited, and her layout makes excellent use the space available: she can accommodate 12 guests in six cabins – a master cabin on its own private upper deck, a VIP cabin on the main deck, and 4 guest cabins on the lower deck. 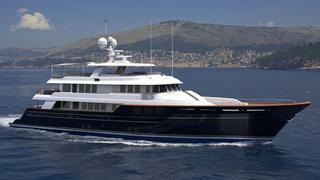 With capacity for 11 crew this new yacht will also cater to the high-end charter market. Delivery is due in early 2012. A detailed model of the boat along with a special sales book will be available to view at the Monaco Yacht Show where RMK Marine will have a team exhibiting at stand QC5.